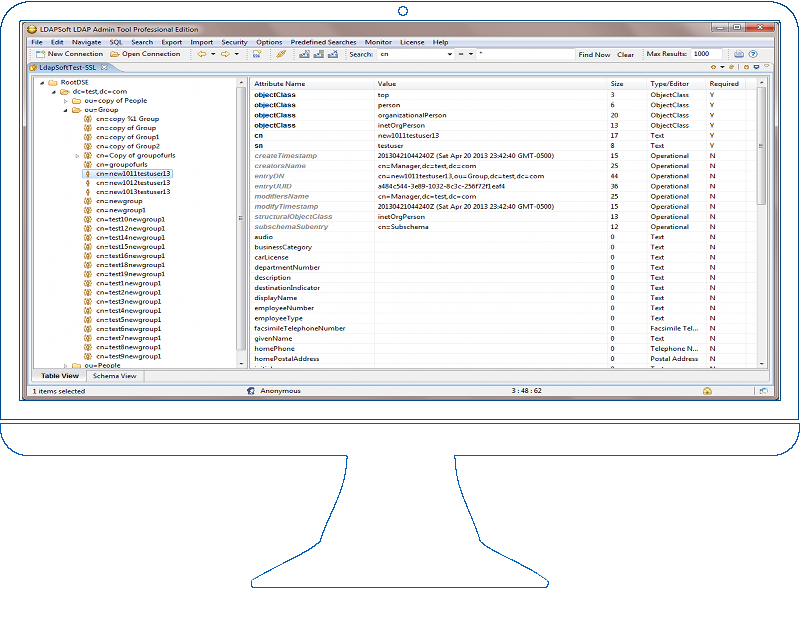 The Professional Edition of LDAP Admin Tool contains more features like predefined customizable searches for both LDAP (common ldap objects one click searches) & Active Directory (over 200 common one click searches). 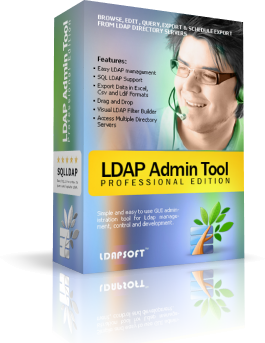 This is the edition of LDAP Admin Tool you’ll want to use if you use your machine mainly in a professional setting. For example, most business users and administrators will need this edition to quickly search directory tree using one click searches and schedule export tasks. (Release Date: October 15, 2016) What's new..
Customize Operational Attributes: New dialog to select which operational attributes to display and export more..
View Nested Members View nested assignments while assigning members. View Nested groups(AD). View nested assignments while assigning groups to users. Your Intuitive, Powerful & Simple LDAP Tool. While assigning members to groups it is often necessary to know nested assignments. With our software's you can view the updated nested members of groups while assigning members to groups. SQLLDAP is easy sql like syntax to query and update LDAP. With our software's you are now able to build and edit query visually with a drag and drop function using keywords and attributes. Viewing all available attributes is the key for ldap management! We made it super easy for you to view all attributes including operational regardless of their assigned value. Need reasons to use this tool? Check some of its key features below. Copy or move objects across containers by dragging and dropping the entries or containers, using Windows/Linux clipboard to copy a set of objects such as DN, LDIF or others. You can perform operations with multiple objects or simply with a single object. When you select an entry all cut, copy, paste, rename and delete operations occur relative to this selected entry. Tabbed browsing in LDAP Admin Tool lets you load different connections in separate tabs of a single admin tool window, so you can jump between them quickly and easily. Using tabs instead of new windows to display content creates a smaller memory footprint and therefore reduces the strain on your operating system and the directory servers. Retrieve statistics from LDAP servers using the LDAP Admin Tool server monitor. LDAP Admin Tool allows you to access OpenLDAP, Netscape/iPlanet, Novell eDirectory, Oracle Internet Directory, IBM Tivoli Directory, Lotus Domino, Microsoft Active Directory, ADAM or any other LDAP v2 or LDAPv3 directory server. You can also connect to multiple directory servers simultaneously and copy data across servers. LDAP Admin Tool lets you customize the behavior of its tools and set a number of other preferences. From the preferences menu you can customize the attribute column shown, adjust the attribute type colors (Required, Optional, Operational, or New attributes), logging, startup options, value editors for attributes and confirmations. Create multiple entries from any one entry. You can create hundreds of thousand of entries from any one entry to determine the sizing of your LDAP server or simulate the load by running multiple instances of LDAP Admin tool to create multiple entries. With LDAP Admin Tool Professional Edition, you can easily schedule excel, csv or ldif export using windows scheduler/Linux cron or run it from command line. You can also schedule sqlldap excel, csv, ldif or pdf exports. LDAP Admin Tool Professional Edition wizards let you easily schedule Excel, CSV, LDIF or PDF export using windows scheduler or Linux cron. You can schedule an export to the file system and/or send such files through email. In addition, the Tool allows you to run the export from the command line. LDAP Admin Tool wizards allow you to import data from LDIF& SQL files to your directory. LDAP Admin Tool supports add, create and modify (including delete and rename) LDIF import operations as well as sql update, insert and delete SQL import operations. LDAP Admin Tool provides a powerful search tool which allows you either to create the search filter text directly or to build a filter visually by selecting the necessary attributes. Search the LDAP using SQL-like syntax. LDAP Admin Tool provides two powerful tools which allow you either to edit query text directly with syntax highlighting or to build a query visually with a drag and drop function using keywords and attributes. LDAP Admin Tool wizards and editors allow you to create, edit and delete attributes of your choosing. The Tool provides a set of powerful editors to edit the binary, Hex, File, image, object class, DN, Generalized Time, Boolean and Integer fields. With LDAP Admin Tool Image editor you can add or update jpeg photo images. Our image editor automatically converts different photo formats to jpg and adds or updates the existing images. Trusted by these clients & thousands more..
3 Years Upgrade Protection (3YUP) provides you free upgrade(s) to the latest release of LDAP Admin Tool Pro. Edition throughout your first 3 years of ownership. This can result in significant savings over purchasing software upgrades. 3YUP is the smart choice of businesses and individuals seeking to benefit from the latest software, at the lowest possible price. At just $185 (Single or Multi Professional Edition), 3YUP helps you get the lowest TCO (Total Cost of Ownership) for LDAP Admin Tool Pro. Edition over a long term period. Find out more about 3YUP. To Purchase 3YUP with the new license, please add Ldap Admin Tool Pro. to the shopping cart and you will be asked to add 3YUP before the final check out. ‡ An Unlimited Site License allows the customer to install LDAP Admin Tool on an unlimited number of computers at a single company location worldwide. * Multi License is a multiple of single license. With one Multi license key you can activate the number of licenses you have purchased. How do we compare different editions? Check out our comparison chart. Got a question? Check out the most frequently asked questions about purchasing our products. LDAPSoft has satisfied customers in over 20 countries around the world. Our products are used by a wide range of developers and system administrators at companies and organization to manage and maintain LDAP and Active Directory. Here you can find latest information about our company and releases! If you have trouble installing, running or using our products? LDAPSoft offers free technical support by Email. Our Support Team guarantees to consider each question from the software users carefully and to supply a response within the nearest 48 hours.